07. Ganymede's Kiss NEW !!! 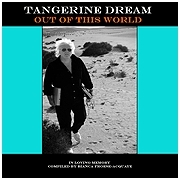 This is the first album compiled by Bianca Froese-Acquaye (Edgar Froese's wife) after the passing of her husband on 20th January 2015. Edgar's music means the world to her - and especially the tracks of this collection. OUT OF THIS WORLD is one of her ways to honour her husband for his huge life work. She added a very personal 12-page booklet to it and ONE so far unreleased track by Edgar: GANYMEDE'S KISS. Of course this small collection can only reflect a tiny part of Edgar's musical legacy, but it definitely spreads a special, sublime atmosphere - in memory of Edgar Froese and his impressive works. Special Tombola: 10 buyers out of the first 100 will receive a T-Shirt for free upon their choice and a TD cap. SHIPPING START: 15 JULY 2015!! !